Certiﬁed bio-organic complete wet food for adult dogs. 100% human-grade carefully selected ingredients of the highest quality create this scientiﬁcally formulated single protein 100% additive-free superfood for your best friend. Gently poached to preserve vital nutrients and vitamins, this unique recipe includes 86% free range rabbit, using a ﬁne balance of only muscle meat and vital inner organs. Essential additional nutrients are provided through a carefully formulated mix of bio-organic superfoods, including sweet potato, apple, pear, coconut, cranberries and seabuckthorn, creating a balanced and delicate superfood with a compelling aroma and taste for the most discerning dog. Enhanced with fermented Jerusalem artichoke concentrate which has a highly beneﬁcial pre-biotic effect to aid digestion and a dog’s ability to absorb the food’s nutrients, complemented by cranberries to support renal and kidney function. The natural vitamin C of seabuckthorn also supports the health of the immune system. Heaven & Earth represents A Taste of Munich, and is inspired by The Rockster’s Journey. What is in Rockster Heaven & Earth? 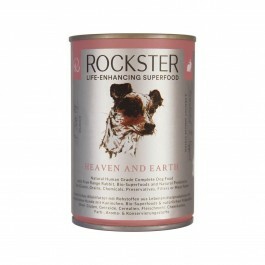 I recommend and always feed Rockster to my dogs, brilliant and it's organic !